The leaves have translucent, glass-like tops with jelly-like contents, stored for the times of drought. 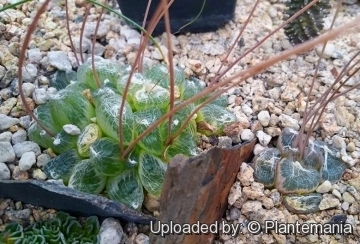 Leaf translucence has earned this and several other succulents with similar appearance the local Afrikaans name of waterglasie (little water glass). Origin and Habitat: Northern Cape, Western Cape. Habitat: It grows in the succulent Karoo vegetation in rocky areas, almost mimicking some of the stemless mesembryanthemums. Bulbine mesembryanthoides subs. namaquensis G.Will. Description: Bulbine mesembryanthoides is a small summer-deciduous succulent geophyte up to 25 cm high, with rosulate fleshy leaves that are buried almost completely during drought, except for the tips, through which the light enter within the subterranean plants body. The Bulbines do not usually show a high degree of succulence, but Bulbine mesembryanthoides has very swollen leaves. Tubers (caudex): Globose to deltoid fleshy with 3-5 ovoid tapering lobes, 1-2 cm in diameter and about 1 cm tall, grey-white. Leaves: Few (1-4) 1,5-3 x 1-2 cm, ovate-lanceolate, erect, unequal, apex acute, truncate or concave and very succulent; yellowish-green, to pinkish-grey, but much darker where they are translucent towards the tips, striate no really round but with sides bent towards each other and grooved in the upper face. (only 2-3 and acute even when withering in subsp. mesembryanthoides and truncate more or less truncate in subsp. namaquensis) The young leaves are linerar-lanceolate acute 15 x 3 mm withering from the top and often becoming truncate. Upper face grooved, lower face convex. Flowers: Inflorescence erect up to 20 cm tall 1-7 flowered. (1-3 in subsp. mesembryanthoides, up to 7 in subsp. namaquensis) Flowers star-shaped, golden-yellow 8-10 mm in diameter, Anthers and stigma yellow. Fruit: Globose 3 mm in diameter. Bulbine mesembryanthoides Haw. : Tuber globose, elongating into the root. Leaves 2-3, terete, mostly acute even when withering. Inflorescence usually with 3-6 flowers. Flowers with a single tuft of hairs. Distribution: Northern Cape, Western Cape. Bulbine mesembryanthoides subs. namaquensis G.Will. : Tubers deltoid. Leaves 1 normal and 1 vestigial, normal leaf truncate, terete, vestigial leaf falcate, acute. Inflorescence shorter, 1 to 7-flowered. Flowers with a double tuft of hairs. Distribution: Northern Cape. 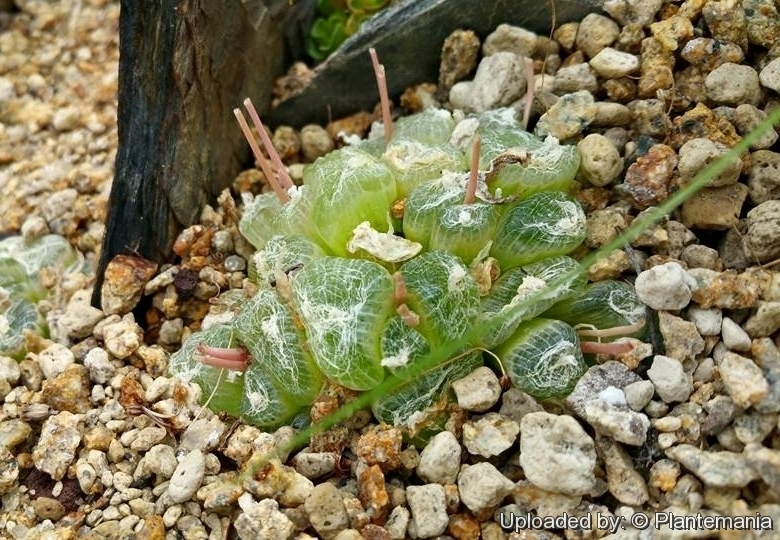 Notes: In Bullbine mesembiyanthernoides, likewise other embedded succulents such as Haworthia semiviva and many species of Opthalmophyllum and Lihops, the light reaches internal chloroplasts in the buried leaf through windows of unpigmented cells on the exposed leaf tips.